figuratively a political or social upheaval. In everyday language, we can have a tendency to overuse cataclysmic language, dramatically describing events as apocalyptic, a disaster, or a calamity, even when they're nowhere near being such - "If I don't put that letter in the post, it'll be an absolute disaster." 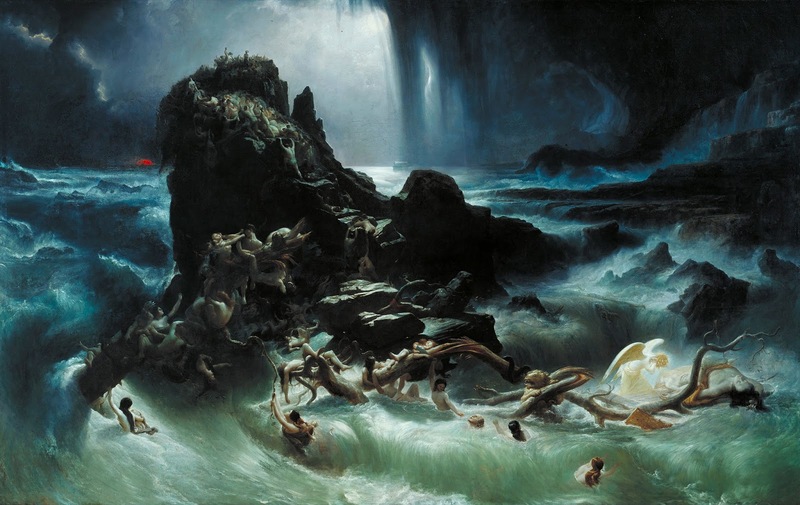 The origin of cataclysm, however, carrying the connotation of washing away or washing down, has found appropriate applications in violent natural disasters such as the truly cataclysmic tsunamis in Japan and Asia. I'm bracing myself for the imminent backlash from the catachrestic police. I rather liked it too, A.N - although I don't know what that red thing is in the background (not that I think anyone in the painting is that concerned about it). It's a very powerful painting. I noticed the red thing too as it really stands out, and was curious, so a-searching I went! Thank you Jingles! Yes, that's makes sense - the sun setting on the old world.